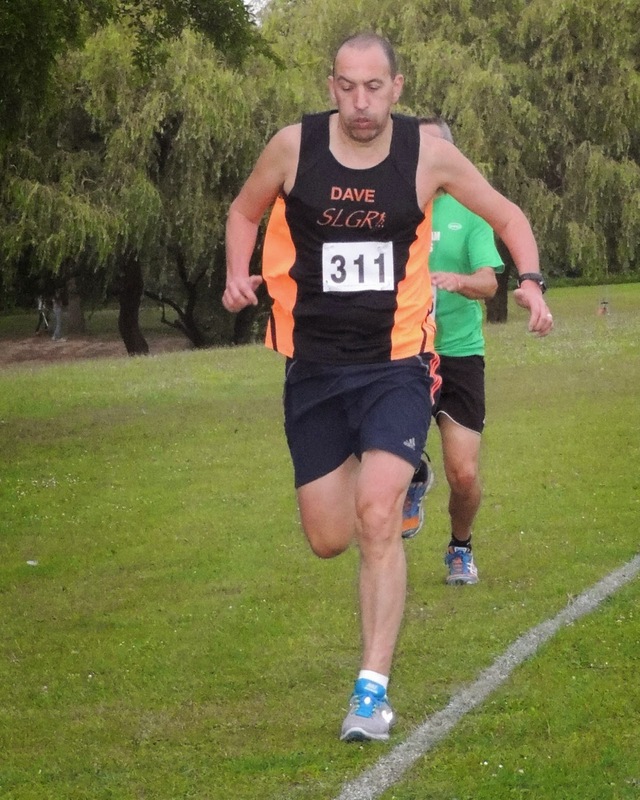 The Swanley Relays are hosted by Swanley and District AC. 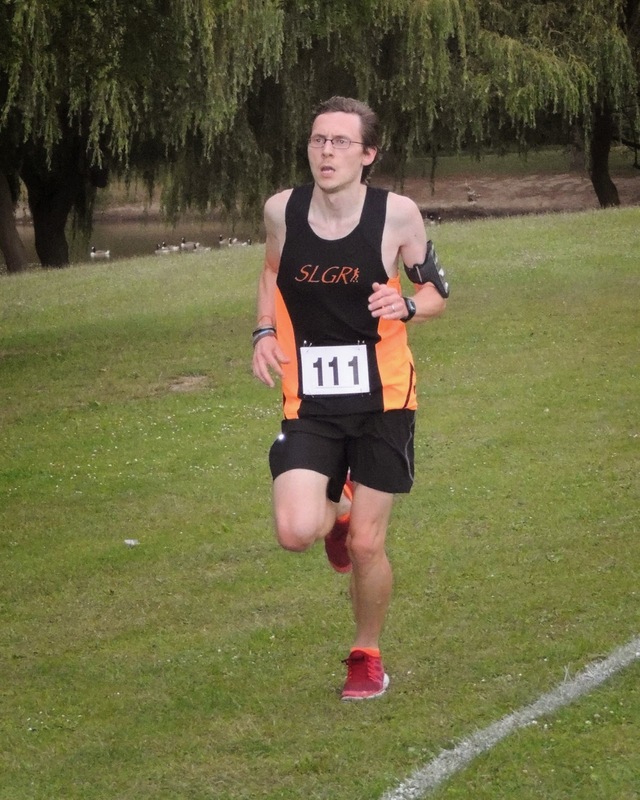 The race consists of 4 x 1 mile legs around the picturesque Swanley Park. I've heard the park described as 'the jewel in Swanley's crown' and I can see why. 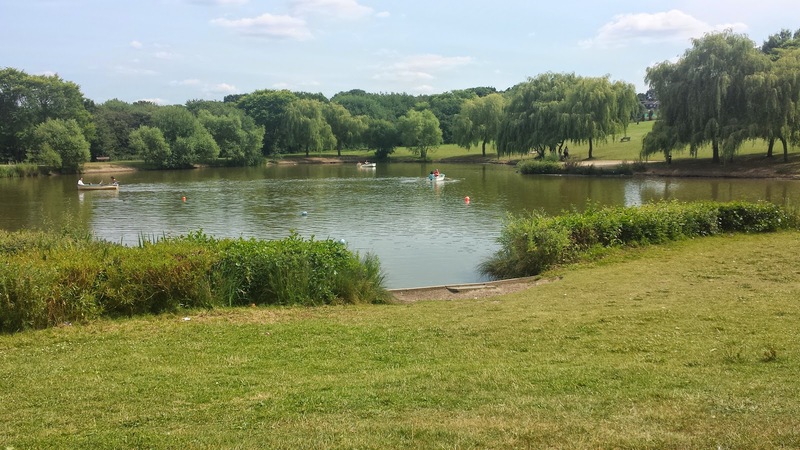 It is a gently undulating park with a boating lake, cafe, miniature train, children's playground and paddling pool. It really is a lovely park. The race took place on a Wednesday evening, and as I had the day off, I arrived, with the family, quite early in the afternoon. We spent some time in the playground and paddling pool, and also took a ride on the railway. The ride on the railway gave me the opportunity to see most of the course beforehand. 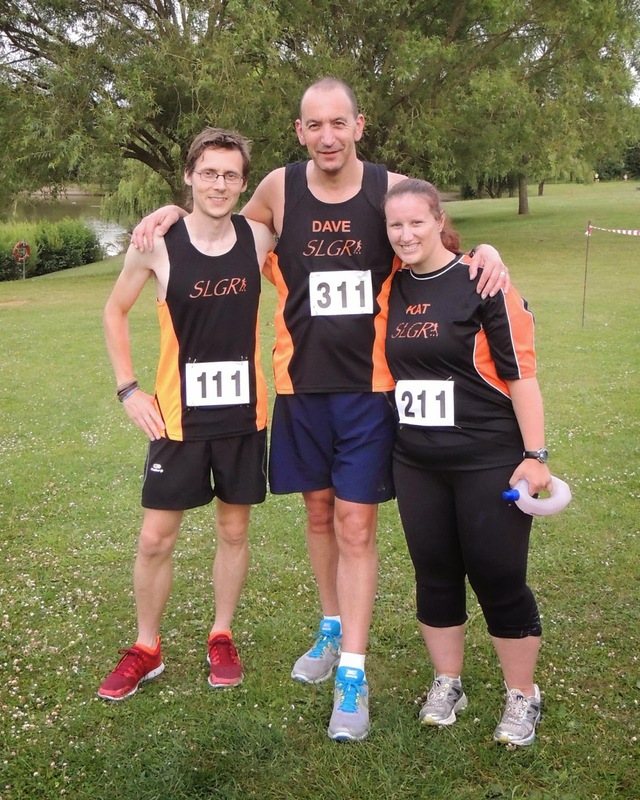 This was to be the first relay race for the newly affiliated 'So Let's Go Running' running club. I had spread the word on the club's Facebook page and managed to rope a few of our runners into forming a team. Sadly, it was only a team of three. The team was as follows - Steven 'so let's go buggy running' Stockwell (me), Kat 'the unstoppable' McVicar and Dave 'any excuse to wear my SLGR vest' Reid. I registered the team on the night and paid the £!0 entry race entry fee. As there were only three of us, I was nominated (or I volunteered - I can't quite remember) to run twice. The downside of having one runner that runs twice is that it made us exempt from any potential prizes. That didn't really matter, because we were here to run as a team. Also in attendance was Brian 'SLGR' Page, the club's co-founder and, for this evening, our chief supporter and photographer! The evening also featured a junior race, and once that was finished, the first leg of the adult race got underway. As I was running two legs, it made sense for me to run number 1 and number 4. The 1 mile lap of the park is run on mixed terrain and its profile is a combination of flat and undulating. Runners have to take care as the route, which starts on grass, passes over the miniature railway lines within the first few hundred metres. The course continues down to the far end of the park, where a gentle ramp takes the runners up onto the platform of the train station. After this, underfoot changes to a gravelly path which ever-so-gently rises as it weaves its way around the perimetre. The course then takes a right hand turn through some trees. It is here that the toughest part of the course is found. The gentle incline suddenly becomes much steeper for a short section - fortunately there is some great support at this section and the climb is soon over. There are a few tree roots and low hanging branches to look out for along this section. Once at the top end, and highest point, of the park, the scene is set for a largely downhill last 500 metres. The downhill starts on grass and then changes as it takes runners back onto the meandering gravelly path before returning to the grass for the final push adjacent to the boating lake. The course was well marked with a white line (similar to the type you'd find on a football pitch) all the way around. At the end of each lap there was an equally well marked out change-over zone. I had been hoping for batons but sadly there weren't any. Instead we just had to tag each other in the changeover zone in order for the next runner to continue the race. My first lap was interesting. I initially ended up pinned inside the group of runners, so I was patient as we rounded the first few corners, but as we got into a wider section, I moved to the edge in order to pass the crowd. Just before reaching the final 500 metre section, I was in fourth position, but I managed to move into third shortly after. In the final 200 metres I felt that I was gaining on the second placed runner, but the finish line arrived before I reached him. I tagged Kat, who was waiting in the changeover area with an eager grin on her face. She launched into action and I stumbled off to the side to begin recovering before doing it all over again. As the minutes ticked away, I chatted to Brian and Dave as we looked over towards the top of the course, waiting for a glimpse of our black and orange kit. Soon after, there it was. 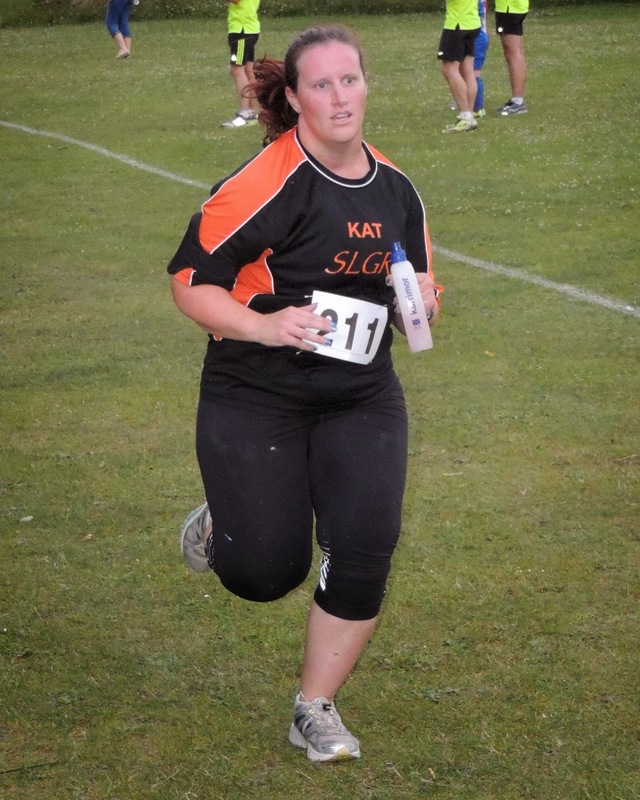 A few minutes later, Kat was on the finishing straight giving it all she had before tagging Dave and in doing so unleashed him onto the course. I stood with Kat while she recovered from her run. We chatted about our laps until we spotted Dave. I moved into position in the changeover area. Eager to set off for my second 1 mile lap of the evening. Closer and closer he came. I could see how hard he was working as he sprinted towards me, and then he tagged me and I was off again, but not before bumping into another team's runner and losing a precious second. As I left the changeover area, I was behind another team's runner who had just set off on his lap, but I soon passed him and ended up running alone. Until, at the far end of the course, I spotted a target. I edged closer to him as we passed over the railway platform and then overtook as we started the gentle climb. Again I was alone for a while. 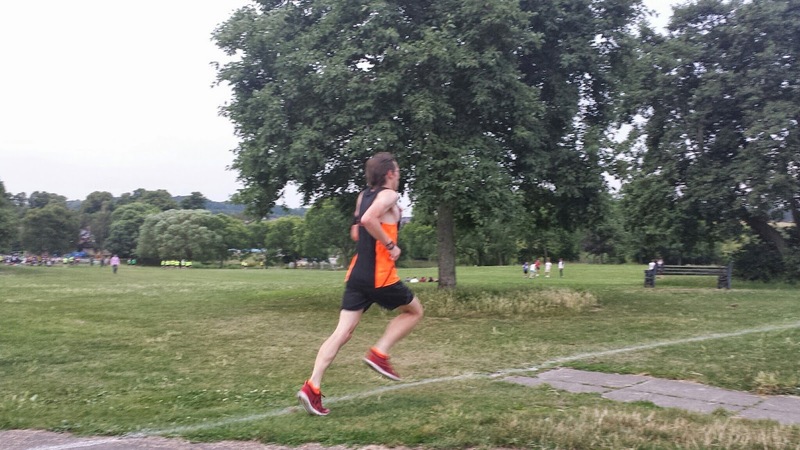 As I made it into the last 500 metres, I spotted another runner and again was able to edge past. Finally I made it back onto the finish straight where I entered the changeover area for the last time and the race was over. As I mentioned earlier, we were not eligible for any prizes. So this was all about the three of us putting in our best efforts for the good of the team. The results were posted online a few days later and we had finished in 19th position out of 28 teams overall. 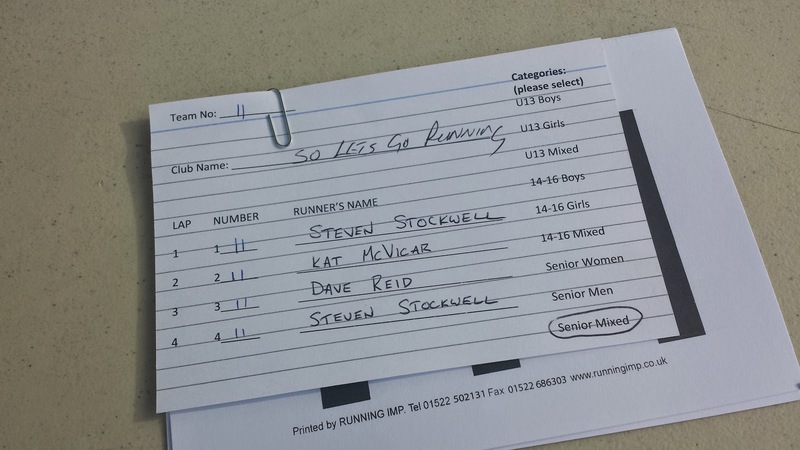 We were second placed senior mixed team, but as I mentioned earlier, we were not eligible for any prizes. All three of us had achieved new personal best times, so we were very pleased with ourselves for that.